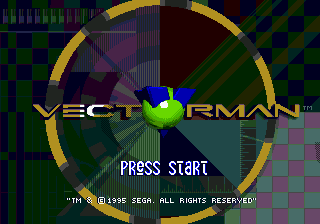 Vectorman (ベクターマン) is a platform game developed by BlueSky Software and published by Sega for the Sega Mega Drive. It was released on 24 October 1995 in North America and on 30 November 1995 in Europe. In 2049, the human population of Earth embarks on a migratory voyage to try to colonize other planets. They leave mechanical "orbots" to clean up the mess they made on Earth through littering and pollution. Raster, a high-level orbot who watches Earth through a planetwide computer network, is accidentally attached to a working nuclear missile by a lesser orbot and goes insane, becoming an evil dictator named Warhead. He declares himself ruler of Earth, and begins preparing to execute any humans who dare return to their planet. The game itself is a straightforward 2D action platformer. Vectorman is an orbot (something like a robot) powered with a ball gun in his hand; powerups include a machine gun, "bolo" gun, and triple-fire guns. and both shoot and jumps. twice will launch Vectorman into a brief boost. Vectorman possesses the ability to transform, through the use of powerups, into several different forms: including a drill, to cut through floors; a bomb, to destroy all surrounding enemies or breakable walls; and an aquatic form, useful for swimming underwater. In addition to powerup transformations, 3 levels host unique morphed forms with which to combat bosses in. Overall, the game consists of 16 levels. Vectorman was made partly in response to Nintendo/Rare's Donkey Kong Country, which contained pioneering graphics with pre-rendered 3D models in its level and character designs, giving the game a smooth, computer-generated feel. Donkey Kong Country's marketing stated that the game was impossible to do on Sega's Mega Drive, and Vectorman acted as one attempt to prove Nintendo wrong. In North America, special randomly distributed copies of Vectorman have a special "you win" screen at the end of the game, along with a phone number which could be called and an address. If consumers sent these special cartridges back to Sega of America before July 31st, 1996, they would receive prizes - one $25,000 prize (won by Keolamanaokalahuinui "Keola" Kaula of Albuquerque), ten £10,000 prizes or one of ninety Sega Saturn systems. Vectorman was both a critical and commercial success, and was re-released in North America as part of the Mega Hit Series. It was acclaimed for its gameplay, level design and 3d graphics, and a great techno soundtrack. Vectorman was not originally released in Japan, with its debut in the country coming through the PC compilation Sega Archives From USA Vol.1. It was released on the Wii Virtual Console on February 27, 2007 in Japan and April 5, 2007 in Europe, and in North America on September 22, 2008. Sonic Gems Collection has both Vectorman and its sequel as unlockable games. Vectorman can be unlocked by playing the compilation for at least 5 hours or by having a save file of Sonic Heroes or Sonic Mega Collection on the memory card. Both games were the only bonus titles to be kept on the international versions of the collection. Sega Mega Drive Collection also features Vectorman and its sequel, this time as games available without the need for unlocking. Sega Mega Drive Ultimate Collection also contains the game. A sequel, Vectorman 2 was produced for the Sega Mega Drive, and was released in 1996. Although BlueSky Software, the original developer of both Vectorman games closed in 2001, a Vectorman game for the PlayStation 2 was announced in 2003 but was soon cancelled.